Looking for unique book ideas for that special reader this Christmas? We’ve got three book reviews from three very different genres to present today! A medical thriller, a devotional cookbook, and a Christian fantasy offer some less-than-mainstream choices for the bookworms on our list. See what others have said and then check them out at your favorite outlet! variety of ways. First there were phone calls, then a prowler, and a fire in her garage. characters are relayed, including their struggles with God. Have you ever had a cookbook that restored your soul as it enabled you to provide food for your own body? Over the course of a lifetime, author and baker Karen Whiting has experienced God’s love and presence through times of plenty and times of drought, and she has baked bread all along throughout those times. In The Gift of Bread, she has compiled those experiences and recipes into a 60-chapter cookbook (with over 55 recipes) that is also full of devotional readings, Scriptures, and bountiful lessons from the author’s own life. The Gift of Bread is a hardback book with a book cover that is priced at $15.99. I have personally baked bread for my family for the past 11 years, and I have seen how fresh bread (with all its nutrients and fiber) has contributed to good health. I’ve also enjoyed making muffins, rolls, and biscotti for fun and for gifts. But as I have progressed through The Gift of Bread, I’ve discovered that I have scarcely scratched the surface of the bread-baking world! Karen Whiting grew up under the tutelage of grandmothers who baked, and she began to learn even as a child the ins and outs of wheat, yeast, oil, salt, and other flavorings, both sweet and savory. As a mother and wife (and even as an empty nester and a widow) she continued to bake bread for her family and community in all occasions. And she noticed bread, grains, and baking being mentioned in the Bible, over and over, in both the Old Testament and the New. God used bread and bread-making to picture everything from hospitality (think of Abraham and Sarah and their heavenly visitors), to courtship (Ruth and Boaz and the gleaning), to provision (Jesus feeding the 5000), to sin (the yeast of the Pharisees), to Jesus’ character (“I am the bread of life”), and so much more. Mrs. Whiting shares about all of these and many other Biblical teachings, in each chapter which contains Bible verses, illustrative stories, recipes, and questions which enable the reader to think about what God might be doing. There is so much spiritual richness in The Gift of Bread to go along with the bounty of bread and recipes! I mentioned that this book contains over 55 recipes. These range from a few craft ideas (a bread plate or layered muffin gifts in jars) to myriad bread recipes. Are you someone who likes making yeast breads? You’ll find the author’s own wheat bread recipe (Honey-of-an-Egg Whole Wheat Bread), which can be used not only for bread but for cinnamon rolls, dinner rolls, and to create more than just bread for meals or sandwiches. This recipe requires hand- (or machine-) kneading and time (4 hours) but produced gorgeous and delicious bread the first time I made it. There are also recipes for a great-grandmother’s daily bread dough (which can also be used for rolls), Amish white bread, cinnamon raisin bread, and several kinds of sourdough bread (even with a starter recipe!). Each of these requires fresh yeast, a warm kitchen area for the bread to rise, and time; but the results are both delicious and healthy. Bread-makers with little experience or much will be able to follow the recipes and create great bread. However, there are many other categories of bread that Mrs. Whiting dips into here, and among those are quick bread recipes (which don’t have to be set aside to rise). These are treats that families can enjoy and children can even help to make. The Gift of Bread includes recipes for fruit breads, muffins, matzo (or unleavened) bread, and cornbread. Specialty breads for holidays (Christmas pastry canes, 3 Kings Bread, holiday macadamia nut cranberry bread, toasted angel bread dessert, Trinity rolls and challah), various biscuit recipes, and bread pudding in a mug introduce us to fun additions to family celebrations. There are even recipes which create a meal out of bread by the additions of meats or fish, as in filled sandwich crescents, treasures in a blanket, or Italian bread salad. And everything isn’t completely from scratch! The baker can make fruit turnovers from packaged crescent rolls or sourdough bread from potato flakes. The creativity is just endless, and bakers of every level of experience will find fun and delicious ways to turn grain into meals, desserts, or bread. In The Gift of Bread, the recipes are clearly written and easy to understand and follow for both the novice and experienced baker. Tutorials are given on ingredients (flour, oil, salt, yeast) and on the various steps of bread-making. Mrs. Whiting also realizes that we live in an era in which not everyone can eat wheat, and she does suggest various flour substitutes to aid those who are avoiding gluten. Yet The Gift of Bread is not only a cookbook. Over and over, the reader is drawn into stories and accounts of God’s provision via bread or grain in both Scripture and real life. We’re reminded that man does not just live by bread alone, but by every word that proceeds from the mouth of God; by that living Word that is Jesus. We’re encouraged to use bread to not only care for our own families, but to share God’s love and community with those in need or simply others whom we love. Each chapter is so rich that (even though I wanted to read the book quickly and dive into new bread recipes as quickly as I could), I found myself taking time over each one; mulling over Mrs. Whiting’s words, seeing God and His love and provision in the grains He’s given us to eat, and the spiritual life He invites all of us to embrace. The Gift of Bread would be a lovely gift for a newlywed or a new believer. It would also be a fantastic cooking/devotional curriculum for homeschoolers, as families could enjoy the chapters during family worship then step into the kitchen to try out the recipes together. I’d personally select this book as a gift for friends and loved ones as well. So much richness for both body and soul is available in The Gift of Bread! books in order to get the full effect of the stories. Plus, then you get to read two other amazing books. I found myself reading the beginning of the book wondering what was going to draw the Larcen family back down below to the Tethered World. Things topside are spiraling out of control and things looked bleak. The characters grew even more by the end of this book and tremendously since the beginning of book one of the series. I liked how God and our need for Him was woven through the story. The Genesis Tree had me laughing, crying, angry, sad, and confused at times. I was shocked and amazed at things that happened (both positively and negatively – ie the things that happened were sometimes good and sometimes bad, but I didn’t see them coming). Like the second book in the series, this book is written in first person when we are following Sadie and third person when we follow Brady. This book also includes the viewpoint of one of Nekronok’s sons (it never really says which one, although by the end you know who it is). There was one major plot element that made me unhappy, but I did like how it was used and redeemed to show that God’s ways are not always our ways and that He uses them for our ultimate good (even if it doesn’t seem like it at the time). I liked how the story wrapped up the “hanging” story lines from the overall story that covered all three books. I will miss visiting the Tethered World. I totally recommend this book (and the whole series). Heather also has a Christmas giveaway to share! Win a Kindle Fire HD, $25 Amazon gift card, and an autographed copy of her first book, The Tethered World. Click this link to enter! 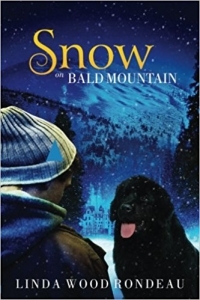 Snow on Bald Mountain by Linda Wood Rondeau with Elk Lake Publishing released Aug. 2017. This novelette is a sequel to the critically acclaimed, Miracle on Maple Street. Ryan McDougal’s wife informs him she’s pregnant. To find better housing, he accepts a job as a caretaker for an eccentric, elderly woman. He wonders why she never leaves her home and seems fixated on three mysterious photographs that line her mantel. But pregnancy complications arise, Ryan finds himself on his knees one more time. Available now in print. Ebook to follow soon. For review contact Linda Wood Rondeau lindarondeau@gmail.com. On September 16, Davalynn is speaking at Christian Family Fellowship in Canon City, Colorado. Topic: “Do All Things Really Work Together?” A book-signing follows. by Andrea Kuhn Boeshaar, Barbour Publishing, released Sep. 2017. Available in e-book and traditional print. The Captive Brides Collection releases Oct. 1, 2017. Love Brings Freedom in 9 Historical Romances: Journey along as nine historical women are about to make their escape from some of life’s greatest challenges. Can their captive hearts be freed to dream, to dare, to love? in the Readers’ Choice Award for her historical romance Sofi’s Bridge. Christine’s latest romance is set in the beautiful Cascade Mountains of Washington State and focuses on the topic of grief. This is the second award that Christine has won this year alone. Her non-fiction memoir Finding Sarah Finding Me won Canada’s 2017 The Word Guild Award and was a finalist in the Selah Awards for life story. Craig von Buseck has taken a position as a Senior Writer with Inspiration Ministries near Charlotte, NC, which is the parent company of INSP TV. Craig will be helping to produce articles and courses for Internet evangelism and discipleship. He will be involved in other writing projects as needed. Craig hopes to expand the articles and courses available on the Inspiration Ministries websites to include outside writers. He will make announcements as opportunities come available. You can reach Craig at craigvonbuseck@gmail.com. Heather FitzGerald is excited and honored to be a double finalist at the OCW Cascade Awards in the Speculative Fiction category. Her first two books, The Tethered World and The Flaming Sword are in the running. Winners will be announced this Thursday, August 17th, in Portland, Oregon. Heather’s husband surprised her with the gift of a plane ticket so she could be there in person (from Texas)! ***This just in…The Flaming Sword won in the Speculative Fiction category!